These organizing tips are easy-to-follow strategies. From the garage to the home office, from the closet to incoming bills, these tips to get organized will de-clutter your space. Can you remember the last time you didn't have to step over clothes and papers in your house? Are you tired of not being able to find things? Does disorganization increase your stress and frustration? In my experience, most people launch into de-cluttering with the best of intentions. They build new shelves and re-arrange drawers, or they buy one of the many millions of organizational gadgets available. While their hearts are in the right place, the best place to start is to assess what you really need! Without assessing what you need the clutter can control you! Do I really need to build those shelves for the boxes of clothes you haven't worn in 3 years? Do I need to buy more filing cabinets for paper clutter that is now all online? What makes me feel good, or adds to your life? Assessing your needs first is important for organizing and clutter control. Once you know what items you want to keep, deciding where to put these items is the art of organizing. Here are practical tips to get organized and, more importantly, to stay organized! Do you think that having an organized home is about adopting the qualities of a "drill sergeant"? If so, you can relax! Organizing your home is less about throwing away the things that have not been used in the last year, and more about recognizing what is important to you and your family. It's about making the spaces of the home a place for living! When was the last time you couldn't find something in your home? Whether it was your keys, your wallet, or that piece of paper with that important number on it, this "searching" causes is stress and frustration. When you have an organized home, the rest of your life comes into order as well. As you walk from room to room, from the garage to the tiniest closet space in your bedroom, these strategies and checklists for an organized home ensure that you have a place for everything and everything in its place. Technology is making it easier to telecommute and the working-at-home trend is likely to increase. With roughly 20% of people working from home or outside the office the right home office organization becomes increasingly important. But working from home presents it's own challenges, not least is the blurring of boundaries between work and play. Probably one of the biggest challenges from working at home is the distractions. The kids running under your feet, the TV in the background, and workspace limitations! This makes organizing your home office important for you and your productivity at home. Are you tired of the mountain of papers that clogs your desk and living space? Do you want to organize your paper clutter? 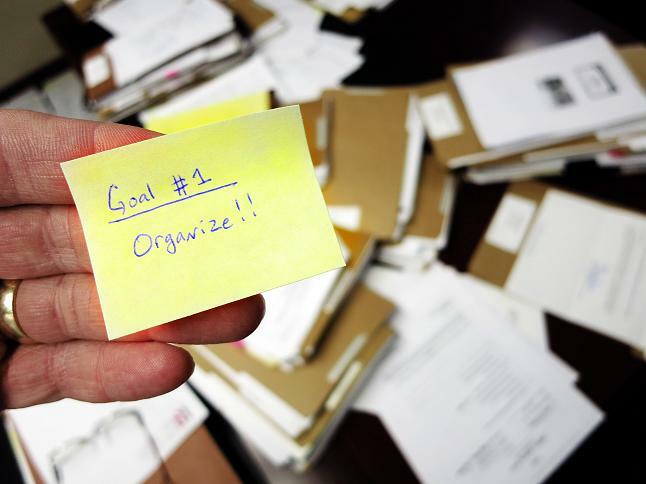 Getting rid of clutter and organizing paper is about having an organizing system. Whether you have a system to organize bills or to manage your paper, your organizing system needs to exist in the different areas of your life. Is your messy desk frustrating you? Did you know surveys have shown that office workers spend between 15-45 minutes a day looking for things? This equates to 2-6 weeks per year of lost productivity and effectiveness! A messy desk is a distraction and increases the chance of pecking at many projects rather than focusing your time and effort on your top priorities. Organize your desk so that you can shave some time off the 2-6 weeks of searching for stuff that you already have. According to time management statistics about 85% of the material that goes into filing storage is never used again.That means that 4 documents are getting in the way of the one document that you are looking for. If getting the right information under your nose is in a timely manner is important for you to make good decisions then organizing your files is a good place to start. If you liked these organizing tips then you will also like the declutter strategies. Do you have some great organizing tips? Do you have a great organizing tips? Please share it!